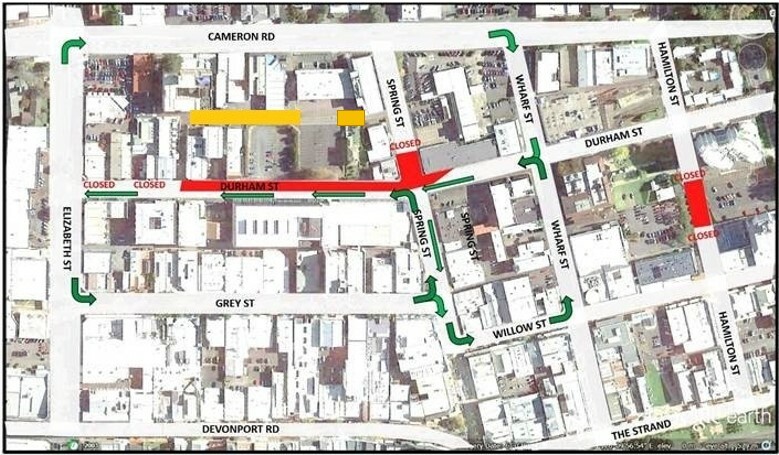 The water main upgrade continues along Durham Street, we are now outside the Fulton Hogan site office. We have approximately two weeks left working on this side of the road, then we will be moving our water main upgrades over to the other side of the road. Power ducting and gas renewal works are progressing well also. We have excavated along the lane and come across some unforeseen conditions that require a redesign. The redesign has been completed at the northern end and work is again underway to construct the new retaining wall. At this intersection, we are working to have cement stabilised metal laid. There is a four hour window from manufacturing this product and having it brought to site and in place. Rain has a negative effect on this product so we need to avoid it carefully. This means we have been tracking the weather closely to ensure the best time to make and lay this product. As you would all be aware, the weather this week has been a little uncertain, so we are looking to find the best weather window as soon as possible to be confident this work can be completed successfully. This coming week is looking more hopeful with some sunnier days!